I hope your week is going well! Let’s remember to keep our eyes on Christ and our noses in the Book! This week we’ll be seeing that Jesus is the Resurrection and the Life from John 11. We’ll also say a special prayer for Megan as she gets on a plane to Asia! I love this song, a paraphrase of Ephesians 1. It’s a great way to start our service as we’re reminded who we were before Christ, and who we are now after coming into His family. We’ve been born again by grace and grace alone! As you know, it’s important to sing old and new songs. We studied the life of Fanny Crosby in our community group, and this one of her most well-known hymns. We played no part in our salvation, so all glory belongs to Him alone! We’ve been redeemed, pardoned, and set free from sin - praise the Lord! Continuing in our corporate worship, we’ll move deeper into the work of Christ and sing this modern hymn which so beautifully describes the person and work of Christ. Only in Him do we find our hope! We’ll finish up our time of singing, by simply declaring His greatness. I also like this song because it has a future perspective - one day all the earth will worship Him, every knee shall bow, every tribe and nation will see that Jesus is Lord! We’ll conclude our service by recognizing our need for repentance, our need for Jesus - the perfect sacrifice. Only by repentance and faith in His life, death & resurrection can we sing “My one defense, my righteous”! But oh what comfort and peace comes when we are born again. He is our hope and stay! I’ve been really encouraged by our time studying John 10! What an incredible picture we have in Jesus being our Good Shepherd. This week we will continue in this chapter and consider one of the most well-known verses on eternal security - John 10:27-29. You don’t want to miss this Sunday! As we start our service, we’ll worship and sing to the one mediator between God and man, the man Jesus Christ. He took our place and became the only Door that gives us access to the Father. Let’s put aside cares and worries from this past week and focus on this great truth! Last week we sang “A Mighty Fortress is Our God”, one of the oldest hymns left that we still sing. This week, we’ll be singing another ancient hymn, written by St. Francis of Assisi in the 1100’s! This version has two extra verses written more recently that describe our response (come and rejoice in His great love) and Jesus’ return (He shall return in power to reign…). Each verse culminates in “O Praise Him! Allelujah!” What an amazing song that has stood the test of time. We normally don’t introduce two new songs in two weeks, but I couldn’t pass this one up because it so beautifully illustrates the passage we will be in this week. With lyrics like “Those He saves are His delight, He will hold me fast” and “He’ll not let my soul be lost, His promises shall last”, this song accurately reminds us that a soul once saved can never be lost. No one can take us out of the Father’s hand! We introduced this song last Sunday, and it’s a great introduction to our time around the Lord’s table. There is great beauty in solid words and a simple melody. This song captures that well, and it also beautifully describes the great grace that “leads us home”, grace that restores us, grace that frees us. We’ll conclude our service by celebrating together with this song of victory! Thought Christ’s life, death & resurrection we have been made new! It was such a privilege to share God’s word with you last Sunday! Thank you for allowing me to serve you and our Savior. Pastor Pilgrim is back this week, and we’ll be back in the book of John, seeing how Jesus is our great Shepherd. Let’s come together joyfully on Sunday to praise our God! He delights in our praise! Over and over in scripture we read that God’s name will be great among the nations. We know that His purposes will come to pass, and He desires to use us in His great plan for this world. We’ll start off our service by echoing scripture, declaring that His name is great! We’ll continue our praise by reminding ourselves that Christ is the only true rock, our source of strength, our help in times of trouble. This great hymn illustrates this truth by comparing everything else in this world to “sinking sand.” Let us hold fast to Christ! As we near the 501st anniversary of the Reformation, it’s important to sing this great hymn written by the author of the Reformation himself, Martin Luther. This hymn reminds us that God is in control, He will prevail over the evil one, and His kingdom reigns forever! As we close out our time of singing, I’m excited to introduce this new song to you. There is great beauty in solid words and a simple melody. This song captures that well, and it also beautifully describes the great grace that “leads us home”, grace that restores us, grace that frees us. Make sure to listen to this song before Sunday! We’ll conclude our service by once again thanking our Savior for the work of the cross. May we live for him daily in response to His great love! Let’s come together joyfully on Sunday praise our God! He delights in our praise! We’ll start off our service by praising the Lord for the change that happens when we become His child. Hope is stirred, hearts yearn, eyes are opened! He is our Savior, worthy of all our praises! We’ll continue our praise by singing about what will happen in the future. Every knee will bow and every tongue will confess that He is Lord! He is our unstoppable God. This song speaks of the sovereignty of our Lord over all creation, as well as over our lives. We are “weak and frail, helpless in the storm”, He comes to our rescue by conquering death & Satan and by providing us with a Redeemer! There is no other response but, Hallelujah! Glory be to our great God! As we close out our time of singing, we’ll reflect on the work of Christ in this beautiful song. He is the true and better Adam, come to save us, who are bound for hell. He is the fulfillment of the law, and it’s in Him that we stand! How have you responded to the “great invitation”? Are you drinking daily in His word - being filled by the Holy Spirit and living for His glory? This week, we’ll continue in our study of John and move in to chapter eight! Last Sunday, we sang the powerful hymn - Holy, Holy, Holy. This week we’ll open by again proclaiming God’s holiness. The earth is filled with His glory! We’ll continue singing this comforting hymn which reminds us of the joy, hope, and peace we have in our relationship with Christ. My favorite line in this hymn is “how I proved Him o’er and o’er.” We can look back at our lives and recount His faithfulness, and we know that He will be with us to the end! After we read a portion of Psalm 103 - we’ll sing this beloved song by Matt Redman based on the same psalm. We’ll close out our time of singing with our new song of the month. There is not better way to close than by bringing all glory to Christ and the work He has done! Last Sunday, Pastor Pilgrim quoted the second verse of this song - “There’s no sacrifice to offer, there’s no penance to complete. Freely drink of living water, without money come and feast.” What an amazing truth! Because of the finished work on the cross, we can draw near to Christ and drink deeply. We’ll close our service with this upbeat song. Paul tells us in Ephesians 1:18, “I pray that the eyes of your heart may be enlightened in order that you may know the hope to which he has called you, the riches of his glorious inheritance in his holy people”. As we start our service, we’ll ask the Lord to open the eyes of our hearts to know and understand “the hope to which he has called us”. We’ll continue singing this great song that focuses on the indescribable nature of our God. No “praise is high enough, words deep enough or song sweet enough” to fully define His love for us! At Shoreline, we love to sing old and new songs. This favorite hymn written by Reginald Heber in 1826, is based off the Nicene Creed. The words evoke a sense of awe at the majesty of God, and call on all of creation – humans, saints and angels, and all living things – to praise the Godhead three-in-one. We’ll finish our service by praising the Lord for the finished work on the cross and rejoicing in His amazing love for us. John MacArthur recently said, “The heart can only go as high in worship as it can go deep in theology.” That’s why it is important to study the word verse by verse, especially the “hard sayings” that we learned about last week. This Sunday we’ll get in to chapter seven and continue our study together. Psalm 148 tells us that all of the universe is involved in praising the Lord. We’ll start by praising Him for his faithfulness, His strength and His committed love. As we continue singing, we’ll turn our praise to Jesus as we sing about the author of salvation, the King of Kings and Lord of Lords. He is the preeminent one throughout all of history, and every knee will bow in worship! In this song, we worship God for His shear majesty and greatness. Taken from Isaiah 40:12-17, it asks us questions that we would not dare to answer except with “Only You, Lord!” We are called to consider and adore Him, there is nothing that can compare to Him! I really enjoyed our family service last Sunday. It was great to get the kids involved a little bit by reading scripture. Next time, I’d love to see a few singing with us on the worship team! This week we’ll be learning a new song and continuing to exalt Christ, the I AM, our Redeemer and Deliverer both through our songs and through our teaching as we finish out chapter six of John. Last Sunday, we sang a couple great songs focusing on God’s grace in our lives. We’ll continue this theme as we start on Sunday morning - remembering the great work of redemption that was accomplished by Jesus. As we continue singing, we’ll turn our focus to God’s attributes as reflected in the book of Isaiah. He is the almighty, everlasting God who cares for the weak and promises to give strength to His people. May we look to Him and stand on the promises of His word! Speaking of standing on His promises, this solid hymn arrangement encourages us to look to Christ for our salvation and for our daily strength. He is the solid rock, our Cornerstone - the unchanging God who is constant in the midst of a chaotic world. We’ll finish our service with this classic song that brings glory to Christ for being our Redeemer. Thank you Father for sending us Your Son! 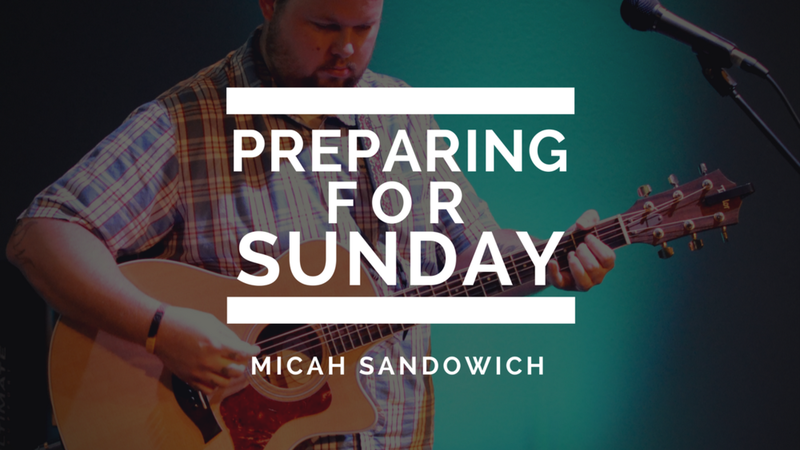 We’re excited to gather together again this Sunday and worship with you! As we finish out the month of August, we’ll once again be singing about our firm foundation - Christ Jesus. We’ll also be continuing in our study of John, starting chapter six and learning that Jesus is Sufficient! We’ll kick off our service by focusing on the saving, atoning work of Christ as communicated in this beloved hymn. In an age when many are denying the atonement, we must point to God’s word - “without shedding of blood there is no forgiveness of sins”. Jesus is the mediator of the New Covenant, we no longer have to sacrifice bulls & goats, Jesus’ sacrifice perfectly satisfied the demands of the law! We’ll finish our opening time of singing with this sobering, yet joyful song. We were once lost in the dark of night, totally blind to our situation, but God came in with His marvelous light and redeemed us. Hallelujah! All we have is Christ! We’ll finish our service with this powerful song that calls us to build our lives on the word and work of Christ. He alone is worthy, and we joyfully give our lives to serve Him! We’re back into the swing of things with Pastor Pilgrim back from vacation and returning to our study in the book of John. If you missed last Sunday, make sure to listen online. This week we will finish out chapter three, learning that Jesus is above all! This song has become one of our favorites at Shoreline. It’s great to start our service with this energetic song taken directly from the words of scripture. It helps to remember at the outset of our service what Christ has done and it will help us direct our thoughts and attention to His great work! We don’t sing this song very often, but as we consider this week that “Jesus is above all”, this song kicks off this triad of songs centered around this theme. He is the “author of salvation” and the mover of mountains. He shows His supremacy in our lives and in our salvation. We’ll finish our opening time of singing with this beloved hymn. It encourages us that even though we are children of weakness, Jesus is our “all in all”. This song once again shows us the supremacy of Christ in His work on the cross. His atonement truly “paid it all” and we can rest in this knowledge, secure in Christ! We’ll finish our service with this powerful song that speaks of the unending, glorious rule of Christ. He is the Lamb that overcame, forever is He lifted high and exalted because of His great work! The Benham family will be on vacation for the next couple weeks, so we have the privilege of having some great guest pastors come and share the word with us. This week, Pastor Carl Dixon is coming and will be teaching us how to be filled with the Spirit. Pastor Carl is a man worthy of respect and honor, this Sunday is not to be missed! We’ll start our service by praising the Lord for opening up our eyes to believe the gospel. Jesus’ work on the cross broke down the walls between us, and by His grace we now have access to the Father. His love is great! And He is greatly to be praised! We’ll continue with the theme of salvation by singing this great song by Paul Baloche. This song describes some of the changes that happen when we get saved - praise rises, eyes are opened, broken hearts are healed and hope is stirred. He is worthy of all our praise! Our final two songs reflect on God’s sovereignty and care in our lives. We’ll start by sining this modern version of “My Hope is built on Nothing Less” by Hillsong Worship. If our hope is built on Christ, then we can have confidence in his sovereign plan for our lives, no matter what “storms” may come our way. He is Lord over all! We’ll finish our time of corporate worship by singing this great hymn. It if filled with beautiful metaphors that describe our lives and our relationship with Christ. Lines like, “when peace like a river”, “when sorrows like sea billows role”, “my sin not in part, but the whole, was nailed to the cross and I bear it no more”. We can honestly sing, “It is well with my soul” because of what Christ has done. Praise the Lord! Praise the Lord oh my soul! We’ll finish our service by coming to the Lord in humility and asking Him to increase our faith. We are weak in our sinful flesh, but we have been given a new nature and have been made new creations in Christ. As we walk with the Lord, we grow in faith as we give glory to Him. The Holy Spirit enables us to walk in faith and trust in His goodness. May we be filled daily! How is your week going? Are you filling your mind with God’s word, seeking to be filled by Him every day? As we seek to live out Romans 12:1-2, I’m more and more convinced that what we fill our heads with affects this in a monumental way. Let us be a church categorized by our knowledge of God’s word, not our knowledge of movie quotes or sports stats. May we be living our lives with an eternal perspective! I’m looking forward to worship with you on Sunday! This is one of the most popular hymns, sung by believers in many languages all across the world. It was written by a Swedish poet in 1885, translated into German, then into Russian and became a hymn. Our English version was translated in 1949 by English missionary Stuart Hine. However, it wasn’t until George Beverly Shea started singing it during Billy Graham’s crusades that it became such a popular hymn here in America. Since then it has exploded, and not a Sunday goes by without many churches singing this great hymn about the greatness of our God! We introduced this new song from Rend Collective last Sunday. It is a well-written, singable song extolling the majesty and greatness of our triune God. We are beggars, standing in awe of what Christ has done. He is our redemption, the hope of all the world, the alpha and omega without end. O that we would have a thousand tongues to sing His praise! This song reminds us that Christ alone is worthy, and He alone can save. We must build our lives upon His word, it is a firm foundation that we can trust! Let us not be shaken! We’ll finish our service by directing all glory to Christ. We must remember where we were before Christ, understand the work of Christ on the cross, and know how that changes everything! It’s only when we understand our own unworthiness, can we truly understand our new life in Christ - Hallelujah! Last Sunday we prayed for David Bechtel - please be lifting him up as he starts this new stage in his life! This week we’ll be continuing in John 2 and celebrating the Lord’s table together. May we be as zealous as Jesus was about true worship! What a great way to start off our service by rejoicing that our debt is paid, and we can stand righteous before the Father through what Jesus did at the cross. This is a great, upbeat song that reminds us “only by the work of Jesus can salvation be secured.” The work on the cross is finished! Let us sing and rejoice! We’ll conclude our opening time of singing by reflecting on the words of Psalm 103. May God give us the grace to bless His name every day, all throughout our lives. As we prepare our hearts for communion, we’ll sing this song, taken from the words of Isaiah 53 -“He was despised and forsaken of men, A man of sorrows and acquainted with grief; And like one from whom men hide their face He was despised, and we did not esteem Him.” We look not to ourselves, but to the old rugged cross for our salvation, all praise and honor must be directed to Jesus! We’ll close out our service by singing this new song from Rend Collective. It is a well-written, singable song extolling the majesty and greatness of our triune God. We are beggars, standing in awe of what Christ has done. He is our redemption, the hope of all the world, the alpha and omega without end. As we finish our service, o that we would have a thousand tongues to sing His praise! This week we’ll be getting in to John 2 and learn how Jesus is our bridegroom. We’ll look at the wedding at Cana where He turns water into wine. If you have missed any of our study, be sure to check out our podcast to catch up! I’m looking forward to singing and worshipping with you on Sunday! In our passage in John this week, we’ll be looking at Jesus’ first miracle: turning water into wine. This song references that miracle as well as some of His other miracles. The main theme of this song is the greatness of God, and resting on the truth that “if God is for us, who can be against us?”. In our American culture, we love to think that we have control over our lives. The false assurance of financial security and political power add to this. The reality is, any “control” that we have is given to us by God. He alone is in true control of this universe and our lives. Only when we let go of our little kingdoms and trust in Jesus will we experience true freedom. This hymn illustrates this truth beautifully, it truly is sweet to trust in Him! We re-introduced this song last Sunday. The inspiration comes from 2 Corinthians 3:18 “And we all, with unveiled face, beholding the glory of the Lord, are being transformed into the same image from one degree of glory to another. For this comes from the Lord who is the Spirit.” The verse essentially says that to “behold” is to “become”….to see glory, or beauty, is to change. And later in that chapter he says what the “glory” is….specifically…it is the glory of God in the "face of Christ”. So the song rather simply and poetically unpacks the glory that we were made to “behold”….the glory of the person of Christ. We’ll finish our service by praying & asking God to be our vision, to be our everything and to welcome us home when our time on earth is done! Let us “Behold our God” this week as we sing and worship Him for his many marvelous works and perfect attributes. Pastor Pilgrim will be finishing up John chapter one this week - see you Sunday! The holiness of God is a great place to start on Sunday morning. The more we understand the nature of God compared with our sinfulness, the more we will rejoice in our salvation! This simple, yet Biblical song by Chris Tomlin will kick off our singing. As we meditate on God’s attributes and our great salvation, this song declares “how can I keep from singing your praise, how can I ever say enough how amazing is Your love”. In this song, we move from God’s holiness to His love for us. The gospel impacts and changes every part of our life, the joy and hope that we now have should truly motivate us to never stop singing & praising! This song is one of the best new songs written about the person and work of Christ. It echoes our passage this week in John, as we are to “Behold the Lamb of God!” Verse one speaks of His incarnation, verse two of His perfect life, verse three of the cross, and verse four of the resurrection and victory! We’ll finish our service by singing about the grace we have received. It truly is “greater than all our sin”, it is marvelous, infinite, matchless grace. Amen! “In the beginning was the word!” What a great start last Sunday to our study in the book of John. This Sunday, we’ll continue in chapter one and hear more from John the Baptist. He correctly states that he was unworthy to even “untie the strap of His sandal.” Our songs this week are focused on the worth of Christ versus our unworthiness. We’ll start this Sunday with this song of adoration and praise. Taken in part from Psalm 19, it declares the sovereignty and majesty of our God over creation. It encourages us to thank the Lord for all He has done and all He will do in the future. His name is great and his heart is kind! This song goes along well with our theme this week. When confronted with the beauty of this world and what God has done, we can’t help but feel small & unworthy. That’s where this encouraging line comes in - “I’m so unworthy yet still you love me”. What a glorious truth! Amen! 1 John 4:10 says, “In this is love, not that we have loved God but that he loved us and sent his Son to be the propitiation for our sins.” It’s because we have this assurance of God’s love & salvation that we can sing this hymn. We love will love him in life, love him in death, and praise him as long as he lends us breath! We’ll finish our service by once again declaring the worth of Christ! He is the worthy lamb who was slain and holy, holy is He! It was great to have our service outdoors last week! A little windy, but thankfully, no rain! This week, we’ll be jumping in to John chapter one and all throughout this series we’ll be singing songs that highlight the person and work of Jesus Christ. He alone is worthy, He alone can save, may we cling to Christ every moment! I love new adaptations of old hymns, but we also should sing the originals as well! This hymn is the “original version” of the song “Cornerstone”. So many hymns so beautifully describe who our God is, and this one is no exception. Our hope is in Jesus blood and righteousness, and we rest on His unchanging grace! This is one of my favorite songs from Chris Tomlin. We worship our God for his sovereign power over all of creation, and over our own lives. He truly is indescribable & uncontainable….truly amazing! This song was our theme song during the “7 Churches” series. It is one that we should sing often, and especially this week as look at John 1. In the chorus we sing, “Arise, shine for Your light has come!”. This is a reference to the first couple verses of John 1 where we read that Christ is the true light coming into the world! We introduced this song at our Good Friday service. It reminds us that we have nothing to offer our Lord, no good works can influence God in our favor. Also, the Christian life is not about us doing things for Christ, but Christ doing things through us! “It’s more than I can do, to keep my hold on you. But all my hope and peace, is that you cling to me!" We’ll close out our service by singing this well known modern hymn, which echoes the first song we sang. We live and have our being only through the great work of Christ! It was great to have Pastor Chris share the word with us last week and a big thanks to Sony for leading in worship! This Sunday is going to be special, as we are having an outdoor service and kicking off our new study through the book of John! It’s been awhile since I’ve gone slowly through one of the gospels - so I’m looking forward to grow in my knowledge of who Jesus is and what He has done! This is always a great song to start our time of worship. It helps us put our focus on what Christ has done, and His great grace toward us. The more often we are reminded of who we are, unworthy sinners, the better we can rejoice and proclaim of our great salvation! As we kick off our study in John, this is a good song to lead us in. We are reminded that Christ is our reward, He is our salvation and nothing in this world will ever compare to Him! One of my favorite lines in the song reminds us that “heaven is our home”. We must have that eternal perspective on our minds - it will change our focus and outlook on life. Our theme at Shoreline this year is “Depth & Devotion”. This song reminds us that our God is worthy all of our praise and every aspect of our lives. We sing together “I will build my life upon Your word, it is a firm foundation”. May that be true in every one of our lives! We’ll close out our service by singing this simple chorus, magnifying the name of Jesus and calling us together, as His body, to come and adore Him!